1. Heat the olive oil in a heavy-based frying pan. 2. Add the shallots and garlic and saute for about 2 minutes until softened but not coloured. 3. Add the mushrooms, season generously and continue to saute for 3-4 minutes until tender and all of the excess liquid has evaporated from the pan. 4. Remove the pan from the heat and add the goat’s cheese with the mustard, parsley and a good grinding of pepper. 5. Stir gently for a minute or two until some of the goat’s cheese has just started to melt, tossing the pan occasionally. 6. Be careful not to over cook this or you will end up with a processed cheese type finish. 7. Transfer the goat’s cheese mixture into a 600ml (1 pint) loaf tin that is lined with cling film. 8. Leave to cool completely, then cover with more cling film and chill for at least 2 hours or overnight is best to firm up. 9. 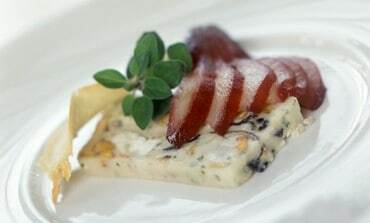 To serve, turn the terrine out on to a chopping board and peel away the cling film, then cut into individual slices. 10. Arrange on serving plates with the fanned out poached pear.